So I was VERY sneaky this morning and when I went to downstairs to let Mom know that I needed to use the facilities, I was NAKED! Somehow I had scratched my collar of during the night. Mom didn't take any pictures because this is a Family rated blog you know. Anyway, it was very sneaky of me. 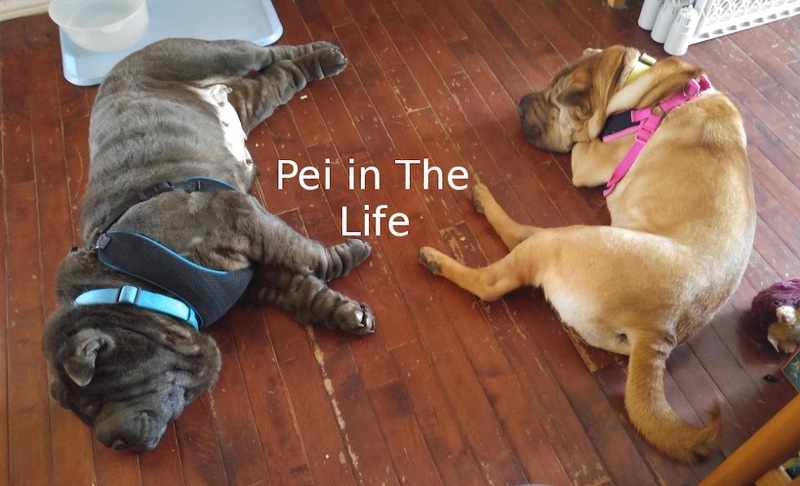 Pei laughter! The interesting thing about Shar Peis and their collars is that they slip off VERY easily. The collars I mean. See? VERY stealthy sneaky ninja pei-ish. Anyway, the important thing that I discovered, Puppy has begun to drop food stuff off the table. Interestingly tasty food stuffs. Like these little apple flavoured round things about the size of my nose. Then there are the things he wears around his neck, bibs Mom calls them. Sometimes they happen to fall on the floor. The rule is, as I'm sure everyone knows, if it's on the floor, it belongs to the dog ...ME. Often times there are tasty things in those bib things and face clothes. Like something called a noodle. They are usually covered in something called sauce. It doesn't quite make up for him splashing his hands into my water bowl though. Or making Mom block off my food bowl so no one can get at it when Puppy is crawling all over MY floor. Sigh. She does pick him up off the floor when I need to eat though. She says Puppy and I should never socialize while we eat. I must agree with her on this one. Human puppies can be great sources of treats and it lasts for years. Pretty soon he'll be toddling around the house dropping goodies as he goes. Oh, they have 1,001 uses.